1. 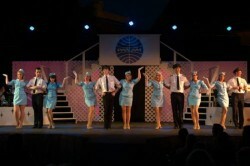 Catch Me If You Can at Annapolis Summer Garden Theatre. 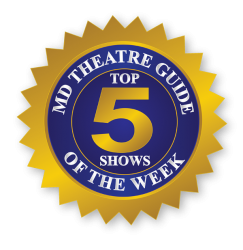 “…a feel-good show…” – Rachel Russel. Synopsis: The season of intrigue continues with a musical comedy about chasing your dreams…and not getting caught!Catch Me If You Can is a high-flying criminal caper based on the hit DreamWorks film and the incredible true story that inspired it. A teenager named Frank W. Abagnale, Jr. runs away from home in search of a glamorous life. With nothing more than his boyish charm, a big imagination, and millions of dollars in forged checks, Frank successfully poses as a pilot, a doctor, and a lawyer—living the high life and winning the girl of his dreams. But when this globe-trotting con artist catches the attention of FBI agent Carl Hanratty, Carl pursues Frank across the country. Along the way, the two forge an unlikely friendship and discover a surprising way to work together. Filled with jazzy music, high-energy dance numbers, and a riveting story, this big, bright new musical was created by a Tony Award-winning “dream team”, with a book by Terrence McNally (The Full Monty, Ragtime) and a swinging score by Marc Shaiman and Scott Wittman (Hairspray). The cast of ASGT’s ‘Catch Me If You Can’ July 2015. Photo by Alison Harbaugh of Sugar Farm Productions. 2. Double Trouble (AKA The Parent Trap) at Imagination Stage. “…great songs and an updated, relatable attitude…” – April Forrer. Synopsis: Lottie and Lisa are ten-year-old twins who are being raised separately by their divorced parents. When the girls meet unexpectedly at Camp Kästner Summer Camp they discover their true relationship, and the high stakes, madcap adventure begins. Having switched places, the girls discover that their deception is hard to sustain. Will their parents be convinced that the sisters belong together? 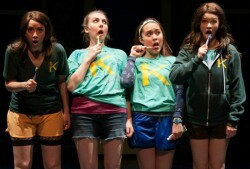 (L to R: Sarah Lasko as Lisa, Emily Kester as Steffie, Justine Moral as Trudy, and Lauren Williams as Lottie). Photo provided by Imagination Stage. 3. Cat on a Hot Tin Roof at Keegan Theatre. “It is not to be missed.” – Morgan Halvorsen. Synopsis: Keegan reopens with this explosive production of Tennessee Williams’ Pulitzer Prize-winning classic. In CAT ON A HOT TIN ROOF, a powerful Southern family gathers at a birthday celebration for patriarch Big Daddy, who does not know that he is dying of cancer. In a scramble to secure their part of his estate, family members hide the truth about his diagnosis from him and Big Mama. Front and center as tensions mount are alcoholic former football hero Brick and his beautiful but sexually frustrated wife Maggie “the Cat”; as their troubled relationship comes to a stormy and steamy climax, a shockwave of secrets are finally revealed. Maggie (Brianna Letourneau) and Brick (Kevin Hasser). Photo by C. Stanley Photography. 4. The Pillow Book in Partnership with Cohesion and Strand Theatre Companies. “…I certainly enjoyed the ride. Synopsis: A Baltimore premiere production. Deb and John are married. Deb and John are strangers. Deb saves John’s life on a mountain. John blinds Deb on the Serengeti. John works at an office. John works at a different office. Deb is a doctor, or an exterminator. The Pillow Book is a journey through the real, the imagined, the absurd, and the parallel. Told with a cast of three, The Pillow Book examines the life in and around one couple’s past, present, and the possibilities that could have been. Joseph Coracle, left, Michele Massa center, and Rebecca Ellis. Photo by Shealyn Jae Photography. 5. Peter Pan at Three Sixty Theatre. “If you are not used to seeing a male actor play Peter Pan then please give Dan Rosales a chance to make you a believer.” – Elliot Lanes. Synopsis: Escape to Neverland in a whole new way with this spectacular, innovative live stage production of PETER PAN that combines intimate theater-in-the-round and overhead surround CGI projection; with actors in dazzling flying sequences forty feet in the air and whimsical puppets that bring J.M. Barrie’s classic tale to fantastical life, creating a truly unique environmental theatrical experience! Dan Rosales takes flight as Peter Pan. Photo by Jeremy Daniel.